During the House floor debate on Friday, State Representative Dan Brady stood up to join House Republicans in calling for a commitment toward a budget solution and compromise. Brady stood in support of remaining in Springfield through the weekend to continue working toward a bipartisan solution to our State’s budget impasse. 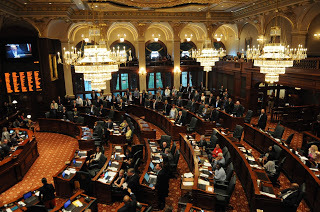 Rank and file members, including Rep. Brady, have been participating in working groups aimed at bridging the gap and coming up with both reforms and budgetary compromises, but Speaker Madigan continues to dismiss these efforts saying they haven’t made progress. He’s wrong. Representative Brady is committed to reaching a responsible, bipartisan budget compromise.